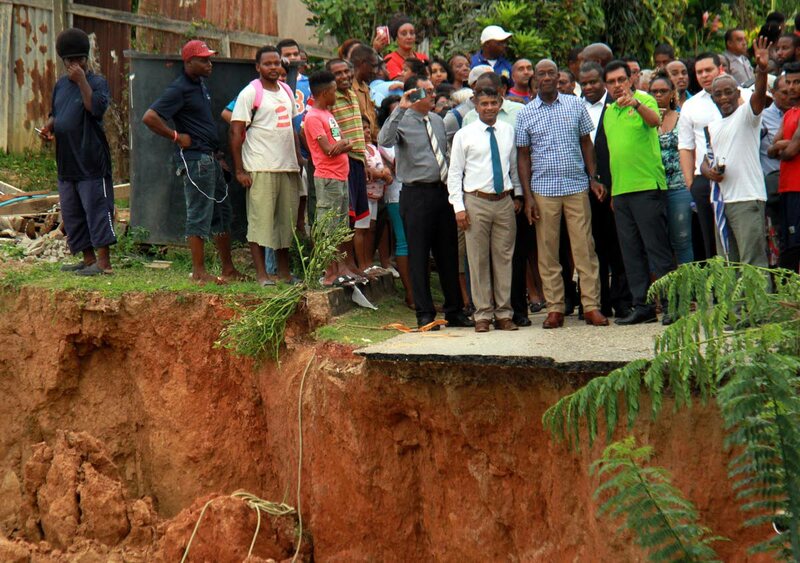 ON THE EDGE: Prime Minister Dr Keith Rowley (in plaid shirt) surveys the damage yesterday in Bamboo Village, Cedros. ALTHOUGH their proverbial navel strings are buried in the houses that collapsed and washed into the sea at Bamboo Village in Cedros on Monday afternoon, Prime Minister Dr Keith Rowley yesterday told affected residents they have no choice but to face grim reality and cut all emotional ties with the area. Rowley said the area is unsafe and they will have to abandon the houses they have lived, some for decades, as the area was now a disaster zone that is unsafe for them. Four days after the devastation struck, pulling one house down and damaging several others, Rowley who is trained in geology, and other members of his Cabinet visited the affected area to get a first hand look and to comfort residents. He described the scene as a geological phenomenon and said it would worsen as erosion took its course. Rowley who was accompanied by Housing Minister Randall Mitchell, Local Government Minister Kazim Hosein and MP for the are, National Security Minister Edmund Dillon told residents gathered along the road in Bamboo Village, that seven houses are on the brink of collapse because of the shifting land. The Prime Minister said they will have to move out of the area as soon as possible and urged residents to work with government to resolve the situation. He told residents that the assessments are ongoing and thanked them for helping each other during this difficult time. Shortly before 6 pm, the prime minister arrived in Cedros via a Coast Guard vessel which docked at Cedros port. Also on the tour were chairman of the Siparia Regional Corporation Dr Glen Ramadharsingh, Point Fortin Mayor Abdon Mason and Cedros councillor Shankar Teelucksingh. Reply to "Move out of Bamboo Village"